We all love making different types of beautiful cards and layouts, who doesn’t. 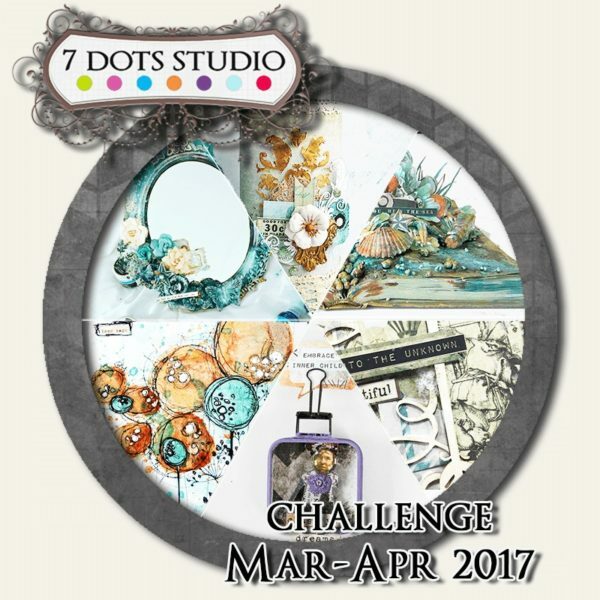 This month we want to do something a little different so we challenged our design team and want to challenge you to create an Altered Art project. 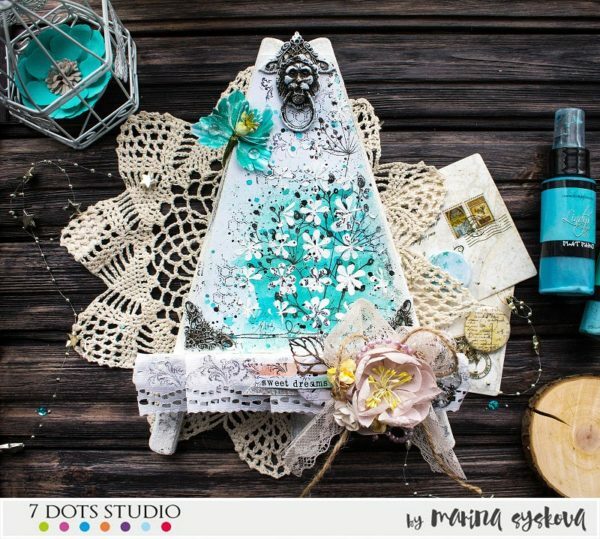 Will it be a accessory, blank canvas or an ornament you own that you think would use some more colour and embellishments here is a chance to transform it and share with us. I created a 3D pop up book page for the Altered Art March challenge. I used both Destination Unknown and Cotton Candy Dreams to create this underwater assemblage. I used chipboard, flowers, mini art stones, real shells and starfish and a mini glass bottle. 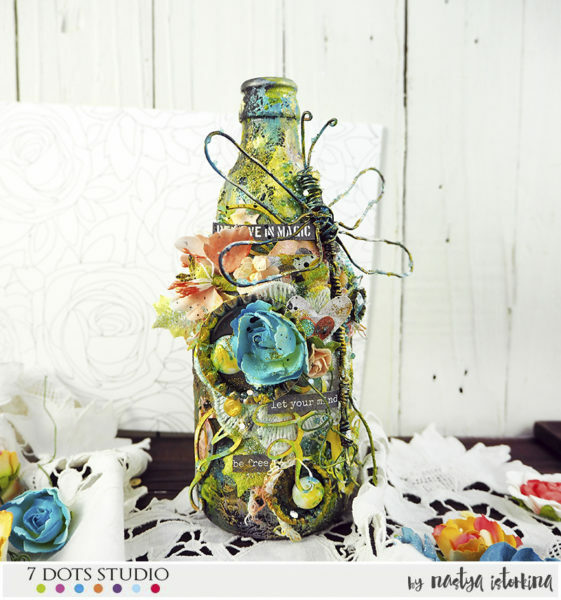 I combined everything with some mixed media sprays, gesso, alcohol inks and stuck it all with gel. I mounted it all on an old hard cover book so it would be sturdy enough to withstand the mixed media products and the heavy pieces. I’m quite pleased with the results. This is a picture of my kids during a photo shoot at the beach so I thought it was perfect for this off the page project. My first idea was to alter something and go really mixed media with it. But as that’s what I love to do, I thought to challenge myself a bit more and go easy with the mediums. Luckily I then found a tall tin jar in my stash and thought to make a pen holder out of it. 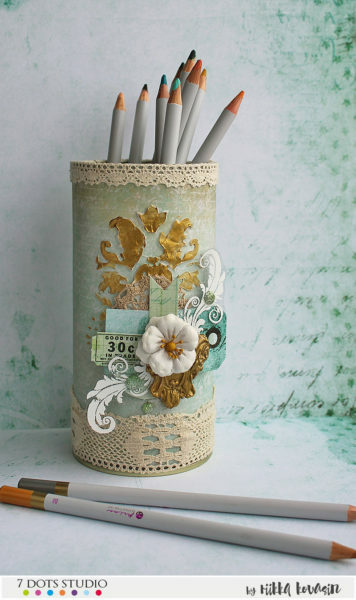 That way I could use more patterned paper and embellishments and not so much mediums! I did use some mediums, but did use quite a few paper elements as well. Can’t wait to see what you do with the theme! I simply love the design of the abstract flowers on the “Cotton Candy Dreams” papers. I wanted to replicate them and combine my own drawing with the printed design onto a canvas. The process was lots of fun as I experimented how to get a similar effect in my drawing to that on the papers. I just love the end result, it’s so whimsical and exactly how I imagined it. 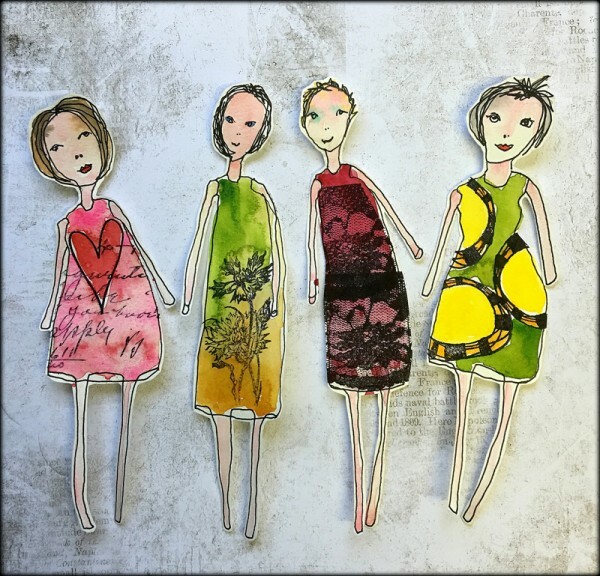 Today Louise is sharing her fun take on paper dolls. 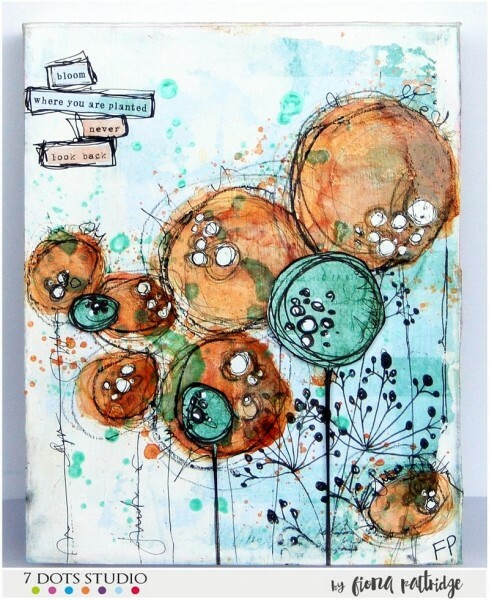 Louise loves to create these just for creative fun, and or to use in her scrapbooking and art journal. Louise thought it would be great to use the fabulous 7 Dots Studio stamps so she has used them to create patterns on the dresses of her quaint hand drawn girly peeps. My self-confidence is very low… like many of us but I really think that beauty lies beyond the mirror! I created this mirror to express this feeling. 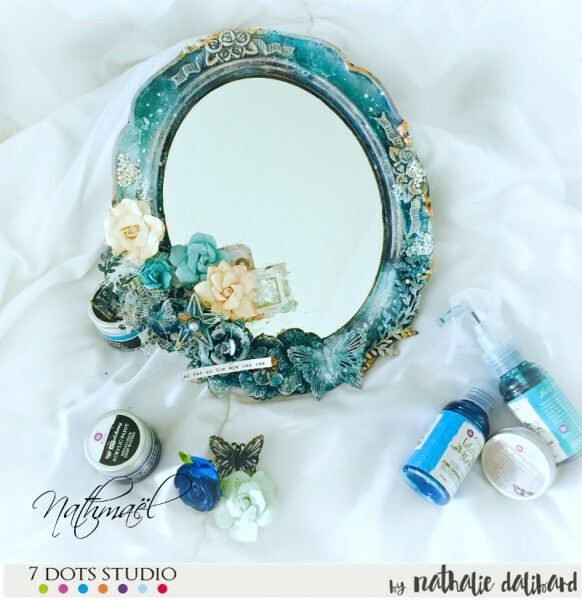 At first, this mirror was white, I used a lot of mixed media products, metal embellishments and played with paints and sprays. Of course, I added 7 Dots Studio goodies, I’m in love with the 7 Dots Studio’s Words Stickers, I want to put them everywhere 🙂 They match perfectly here, don’t they? In this creation, I had fun altering a small box. I love using the 7 Dots Studio papers as the are of nice quality and thickness. I love texture and 3D feel so I embellished the box with a bit of chipboards and tags. It turned out magical and mystical at the same time. 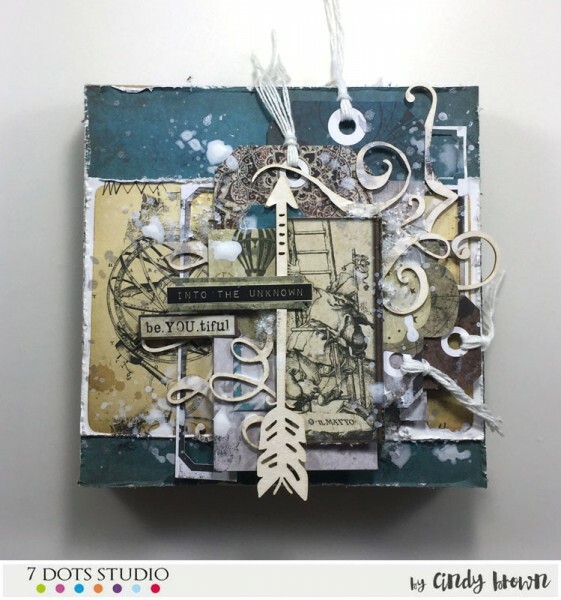 For this challenge, I made small rectangle boxes form 7 Dots Studio papers to add to my canvas to get more volume. I added mediums as well for texture and to decorate the whole. I also used stickers and tags also from 7 Dots Studio. A real pleasure to create. Hello,Everyone! 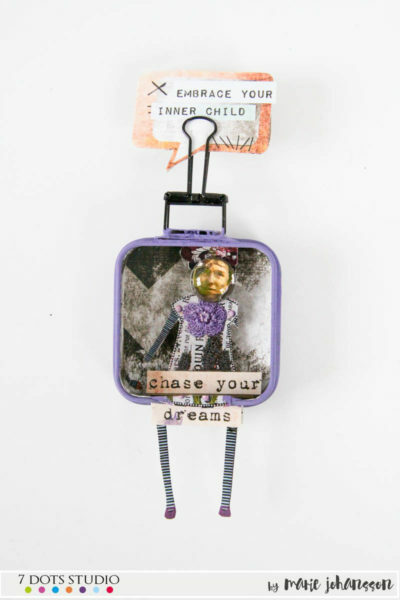 This is my project for Altered Art Challenge. 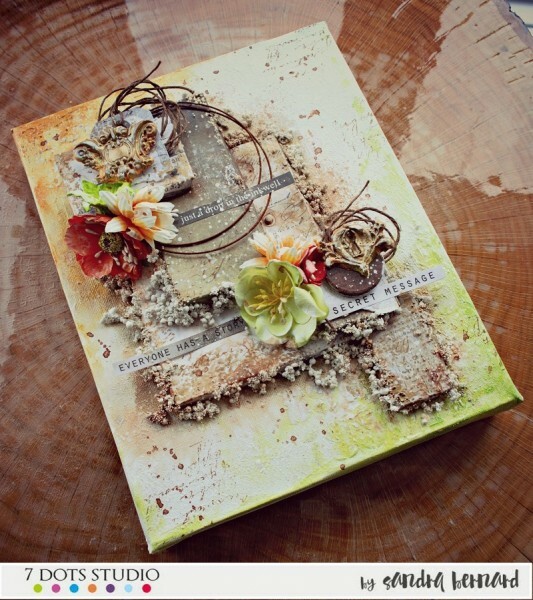 It’s an easel for my cards and tags photo sessions =) I used Sweet Candy Dream Collection. I love altered art! My favourite things to make awesome are bulbs and bottles. So, this month I decided to make spring bottle with wire dragonfly. And now it is my favourite 3D-project. I really love all this glitter and bright colours, and almost alive dragonfly! 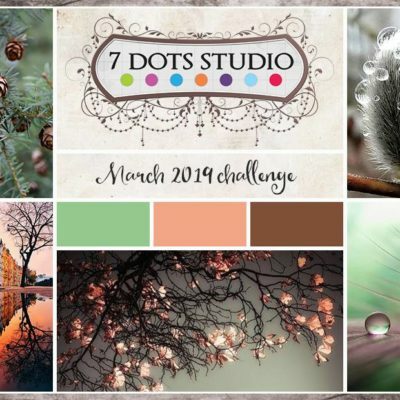 Challenge is open till April, 19th midnight CET. We announce winners by the end of the April.